Have anyone seen this kind of dial before? It seems to be original (not printed on). 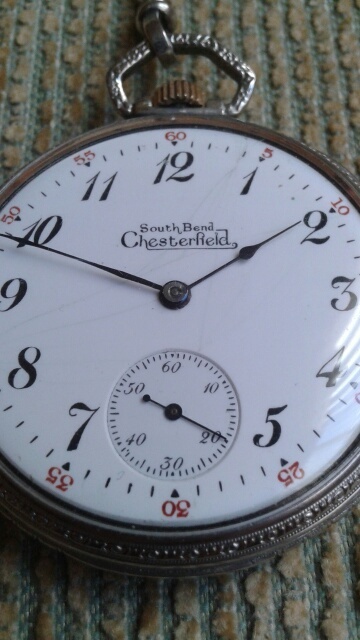 I heard of Chesterfield grade or case but never seen on on dial perhaps someone will look in to that. The dial looks all original to me. I saw it on ebay, but didn't pay too much attention to it. My guess is the dial was made specifically for advertising for a dealer. A display type watch. Only thing that gets me is its in a wrong case (not chesterfield) fromt he looks of it. Very possible it was in a solid 14k chesterfield case which has since been scrapped? The porcelain dials were only put on very early grades of the 12s series from my observations. Thanks Jared, I will examine it when I get it in my hands, by chance I won this auction . And you are right about regarding case, interesting find anyway.